Black widow spiders can be found in all four deserts of the American Southwest, including the Sonoran Desert where Phoenix is located. There are different types of widow spiders, and all of them are venomous to varying degrees. In Arizona, you are most likely come into contact with the L. hesperus species of spiders. You can recognize the black widow spider fairly easily: The female black widow is shiny black and usually has a reddish hourglass shape on the underside of her abdomen. Her body is about 1.5 inches long. Adult males are harmless and about half the female spider's size, with smaller bodies and longer legs. The black widow is the most venomous spider in the United States. People rarely die from black widow spider bites because the amount of venom injected is so small. The adult female black widow is venomous. Males and juveniles are usually harmless, having smaller quantities of venom as compared to the female. 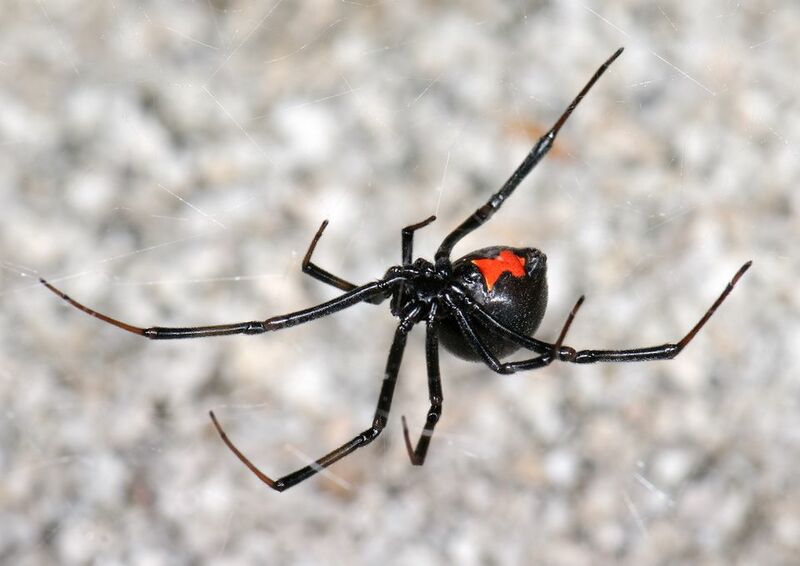 The female black widow spider is sometimes referred to as the "hourglass" spider because the red marking on her belly is often in the shape of an hourglass. Sometimes it might look like two triangles. The adult female black widow spider is often easy to see since she hangs upside down in her web, making the red hourglass marking visible. The female black widow sometimes eats the male spider after mating. The black widow spider is nocturnal and will generally only attack when disturbed or touched. The best way to keep black widow spiders out of your world is to keep areas clean and free of webs. The spiders prey on insects like crickets and roaches, so if you regularly rid your property of insects, you should have fewer black widow spiders. You will find black widow spiders most often in dark, hidden places, such as garages, sheds, or woodpiles. Webs are usually near the ground. People who are bitten by a black widow usually don't look first; they stick their hands somewhere where it is dark and cool and get a surprise. Keep your hands and feet away from old piles of junk or wood in your yard. Regularly check those cooler, dark places, like the garage, for webs. Common insecticides may or may not be helpful. Check all labels before using commercial insecticides, especially if you have small children or pets. When in doubt, contact an exterminator. If you are bitten by a black widow, the first thing you should do is call your doctor, go to an emergency room or urgent care facility, or call 911. Wash the bite, apply an antiseptic, and follow the doctor's orders.